Earlier this week Petro Poroshenko, the president of Ukraine, tried to provoke a war with Russia in attempt to stay in power by cancelling the upcoming elections. Today he attempts to curry favor in the U.S. with remarks about the death of the former U.S. President George H.W. Bush. The former US President George W. Bush passed away. True leader and statesman. This man - the legend, under whose presidency the world saw the end of the Cold War. This man - the era, who then witnessed the restoration of Ukraine’s independence. 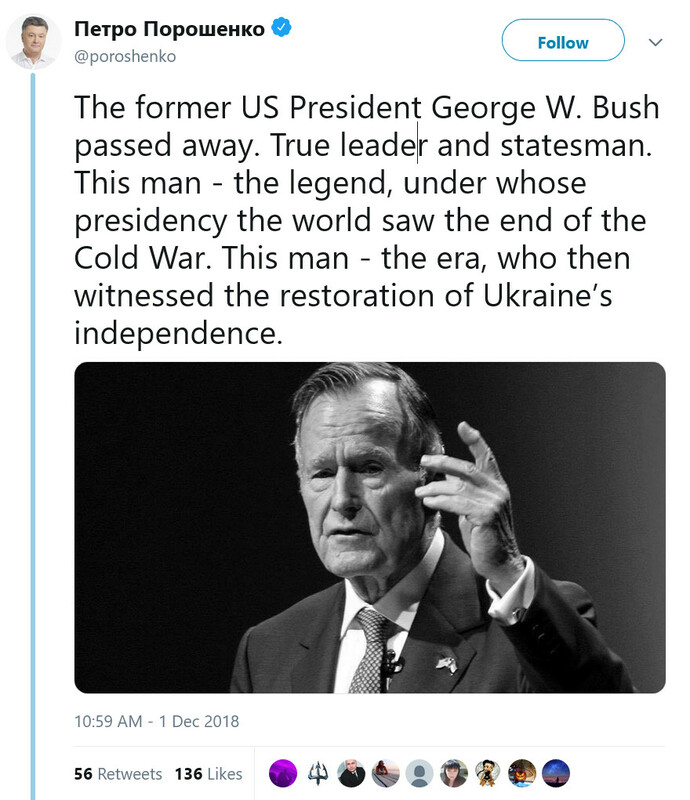 Poroshenko not only mourned the wrong President Bush, he also mislead about the historic record. Bush the first indeed "witnessed the restoration of Ukraine’s independence". But it happened against his strong advice. Bush had feared that the Soviet leader Mikhail Gorbachev was too weak, and that a dissolution of the Soviet Union would end in utter chaos. He traveled to Moscow and Kiev in an attempt to keep the union together. On August 1, 1991, months before a December referendum in which the Ukraine voted to withdraw from the Soviet Union, he visited Kiev and held a speech in the Ukrainian parliament. I come here to tell you: we support the struggle in this great country for democracy and economic reform. In Moscow, I outlined our approach. We will support those in the center and the republics who pursue freedom, democracy and economic liberty. Americans will not support those who seek independence in order to replace a far-off tyranny with a local despotism. They will not aid those who promote a suicidal nationalism based upon ethnic hatred. Bush told the members of the Verkhovna Rada not to seek independence, but to stay in a union with Russia and other soviet republics. Bush was advised by the realist Brent Scowcroft and it showed. The speech was drafted by Condoleeza Rice but Bush personally edited it to empathize his main point: Ukrainian independence was dangerous as it would lead to fascism. The (neo-)conservative NYT columnist William Safire called it the "Chicken Kiev" speech. Safire believed that Bush misjudged the issue. History proved that the neo-conservative view, which infests U.S. foreign policy up to today, is wrong, and that the realist view is right. Easterners are angry that pro-Bandera banners, posters and graffiti are popping up all over Ukraine and with the rewriting of history in general, where violent nationalists who fought alongside the Nazis are treated as heroes while Russians, who suffered under Stalin no less than the Ukrainians, are denigrated. All that happened after the Ukraine's independence, and especially after the U.S. controlled unconstitutional coup in 2014, proves that H.W. Bush was right. A Ukraine within a much larger Russian Federation would be less of a powder-keg, and much better off than it is today. The outright fascism that is now promoted in Poroshenko's Kiev, with U.S. neo-conservative support and the help of U.S. special operation forces, will only pull the country further apart. There is little else to say about H.W. Bush. He was a run of the mill war-criminal just like other U.S. presidents were. As CIA director he oversaw and covered up state sponsored terrorism. As president he attacked Iraq under false pretext. He ordered the complete destruction of Iraq's electricity network the consequences of which are still felt today. That was a war crime as all basic infrastructure is protected under the Geneva Conventions. He further destroyed the country with punitive sanctions that killed half a million Iraqi children. Besides that he fathered some mediocre sons.